Another soon-to-be-married couple are on their way to forever. 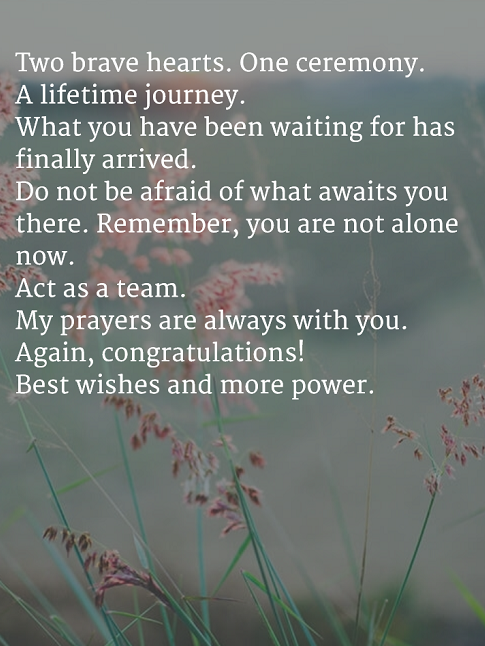 Wish them well with these simple yet heartfelt messages on their special journey. This is a perfect time to cheer them up and wish them a very happy married life. Two brave hearts. One ceremony. A lifetime journey. What you have been waiting for has finally arrived. Do not be afraid of what awaits you there. Remember, you are not alone now. Act as a team. My prayers are always with you. Again, congratulations! Best wishes and more power. The secret to a perfect relationship is to keep God in the center of it. You might have heard about it several times. Maybe from a friend or relatives. Well, I will say it again because I think this is the most important thing you should know about marriage. God has been so faithful to your lives. Happiness for both you is all I am wishing for. You are blessed and highly favored. Congratulations on your big day!! Finally, my favorite couple had decided to tie the knot. Both of you are a good example of a pure love. Love is what made you this far so better keep it always. Wishing you a wonderful life together. Congratulations and best of luck! I am happy for both you. I witnessed your love from the beginning and how you manage to get through all the ups and downs of your relationship. You both deserve this happy ending. Sending you my prayers of a happy, abundant married life. Congrats! I saw the sparks in your eyes when you looked at each other, the unexplainable happiness in your smiles, and the way you hold each others hand like no one wants to release ones hold. It all shows how much you love each other. Well, I am more than happy for both of you. God bless you with smart and beautiful children. Congratulations and best wishes. Welcome to the club guys! The wait is finally over. Well, marriage is never an easy life. You have to work for it, give the best that you can, and cherish every moment of it. But it is also what gives you an extraordinary happiness and fulfillment. It is a lifetime promise to each other, so make it worth living. Congratulations on your wedding! Look who’s getting married! I remember those times when both of you are like cats and dogs when fighting. Who would ever think that both of you are meant for each other. It is true that love is full of surprises. Hahaha. Seriously, I would like to say to the soon-to-be-husband to take good care of his soon-to-be-wife all the time. Make her feel beautiful all the time. Same goes to the wife. Make sure everything is well managed at home. I am wishing you all the best. Congratulations! I have known the two of you when we were still in college. From that time I already knew that you will be married someday. That day had finally arrived. I have nothing else to say, but to wish you an awesome life ahead. Keep up your faith. Congratulations! I can hear the wedding bells from here. This is it! Wow! I cannot find the right words to say to express how happy and excited I am for both of you. Congratulations! P.S. Im sure you will have beautiful kids in the future. Congratulations on your wedding day! This is the start of a new chapter of your life. Make it fun and God-centered. Make His word your foundation and His love to sustain your marriage. We are all praying for your wonderful life together. Best wishes. This is the day you will say your vows for each other. Take it seriously. Marriage is more than what you think for. It is a union of man and woman. You are now one and act as one. God bless your wedding day. Have a blessed married life. Congratulations! You are the sweetest couple I’ve ever met. You are so in love with each other and you are not afraid to show it. It is no surprise that both of you finally decided to get married. We are all happy for you. Let me share with you what Dietrich Bonhoeffer said, “it is not love that will sustain the marriage, it is the marriage that will sustain the love”. Remember, it is a lifetime decision. God is there to help you. Wishing you the best in the world. Congrats! Another couple to tie the knot soon. Congratulations in advance. We are all excited for the big day. Just to give a little glimpse of what awaits you after the wedding. Expect that it is not always a happy day for your relationship. Sooner or later you will face different situations that will test your relationship. You do not have to worry about it. It is a normal thing about marriage. Keep your prayers always with you. It is God who will help you get through it. Always remind yourselves of your promises. Every tomorrow is a new day for you. Again, congratulations and best wishes! I am sending you my best wishes on your wedding day. How I wish to witness it personally, but because of an urgent matter, I will not be able to attend. Nonetheless, I am super happy for you! I will just wait for pictures and videos. Show me plenty of it, please? 🙂 Congratulations! I’m sure you will be the prettiest bride in the whole wide world. Your husband-to-be is so lucky to have you. One of the kindest in our team. Beautiful inside and out. Enjoy your wedding day. This is the start of your much awaited fairy tale. Congratulations my friend! Another member of the family is getting married. Who’s excited? Me, of course! I cannot wait for my grandchild. Yes, I am thinking about them as early as now. I am glad to welcome another member of the family. Beautiful soon-to-be-wife. No wonder why my son wants to make it soon. Just kidding. I know you’ve been praying for it for years now. God finally had answered. Well, congratulations! I love you both! Best wishes on your wedding day! You are now on your journey to forever. Grab a popcorn and enjoy! Congratulations! Friendship is where it all started. And then you start dating. And the next thing I heard is that you are getting married. Congratulations! Always keep the fire burning in your relationship. Make it awesome. Rock each other world. Best wishes! Look who’s getting married! I thought you will not made it this far. I am just joking. Honestly, I am one of those who are so happy that you made it. Looking forward for wedding cakes and surprises. Cheers and best wishes! Every woman’s dream is to get married. This is a dream come true. I bet you cannot believe it until now. I am happy for you, my dearest best-friend. Well, I am a little bit sad because things will change a lot from now on. I cannot just ask you out for a movie, or stay late at night on the phone talking nonsense. But more than that, I am so much excited for you. Praying for your endless happiness with your super kind soon-to-be-husband. Hugs and kisses. Congrats! A heartfelt congratulations to the two of you. Love each other like no one else do. To the soon-to-be-husband, never abuse nor take your soon-to-be-wife for granted. She is precious. To the soon-to-be-wife, always make sure your soon-to-be-husband gets the attention he needs. Help him to be strong. Let the love of the Lord be felt on your lifetime journey together. Best of luck and God bless your marriage. When the two of you decided to make everything official on your wedding day, both of you agree that there is no turning back. Have the courage to face this new level of your relationship. Keep up your faith and trust Him more. God surely will not leave your side, especially when you pray together. My biggest congratulations to both of you! There’s a saying that when a woman is quiet, millions of things are running in her mind. You have to deal with it soon. Make your soon-to-be-wife is happy always. Congratulations, my brother! Take good care of your future family. Happy wedding! Your wedding day is the only good news I received today. I am glad you finally decided to take the next level. Keep on going! There’s lot more waiting on your marriage. Always love and trust and understand. Congratulations! I pray for your wedding day today. I am sure it will be perfect. It is a your dream wedding, and I witnessed how you plan every single detail of it. This is it, finally. But more than your wedding day, plan for your future family. Make everything worth your effort. I know you will be a good husband and a father. I am one proud mother here. Congratulations, my son! Best wishes. God bless you more. I have been in many wedding ceremonies before, but I’m sure yours is worth watching. Best wishes on your wedding day! Congratulations! Happy wedding day and even happier life together. Make every day memorable. Cheers! Congratulations! Let us celebrate your wedding day! We are happy to hear that you are getting married. We will finally taste those wedding cake and wines. Prepare for a more wonderful life ahead. Congrats and best wishes! Marriage is no joke. It is lifetime decision. It will take a lot from both of you. Sometimes you are happy, the next day you are not. Wait, this is not to scare you. In fact, I am encouraging you to be strong. Why worry if there’s a God who can help you always. Just whisper a prayer and He will answer. 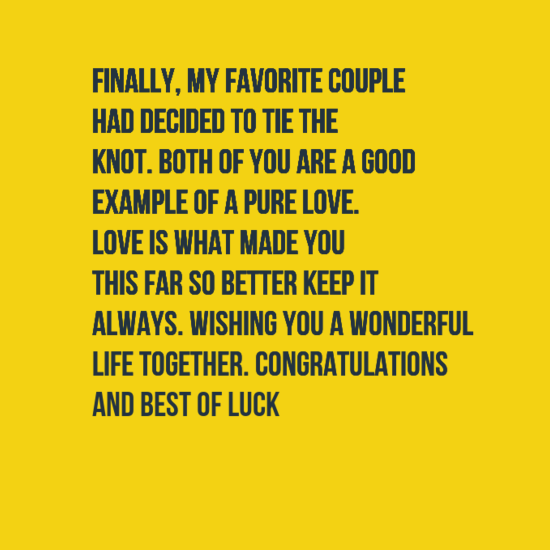 Wishing you success and better life together. True love waits. No matter how long you’ve waited for this special day, what is important is that you never gave up on it. Both sides waited patiently. And now that God finally answered, everyone is shouting congratulations. Enjoy your life together. Never let the day end without saying “I love you!” to your partner. Make it a daily routine. Say it like you mean it. Stay in love always. Again, congratulations and best wishes! 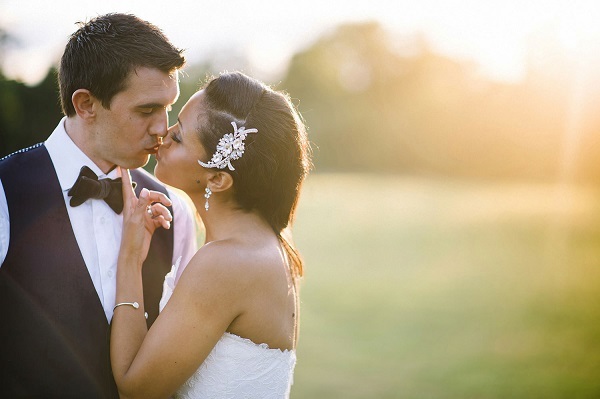 When two people fall in love, the world comes to watch them as they marry and move on. 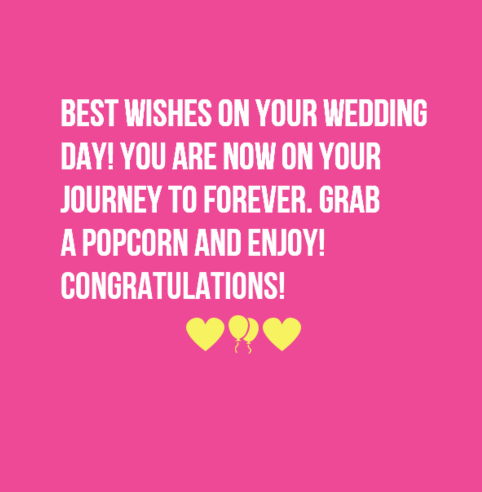 I am watching you as you get married today, and I wanted to wish you congratulations on this special day! I know that the two of you have found a special kind of love, and I want to congratulate you as you get married and take a step forward together. Congratulations on the wedding, and may the rest of your life together be one that is filled with every good thing imaginable. Congratulations to a couple deserving of all of the happiness in the world. May your wedding day and your future be filled with all that is good. I hope that you two celebrate not only today but every day as you move into a new kind of future together. Congratulations on the wedding and best wishes for all that is to come. Congratulations to two people who always give to others and never seem to focus on their own needs. I hope that your wedding day is amazing and your future is incredible. Congratulations on the wedding and may the future be everything that you ever hoped that it might be. 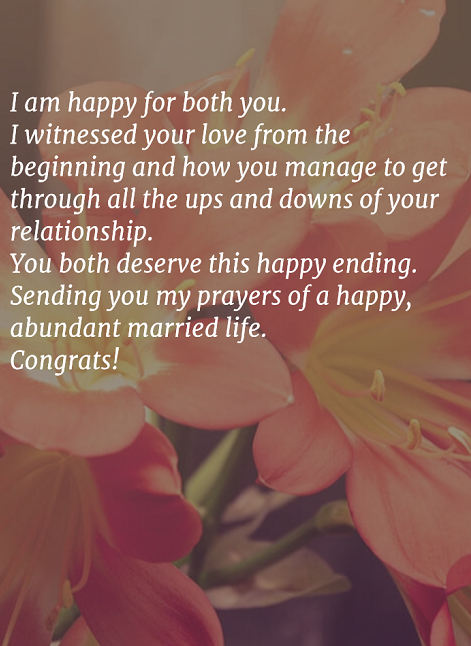 Congratulations on the wedding and may the two of you grow closer each day as you live out your lives together. 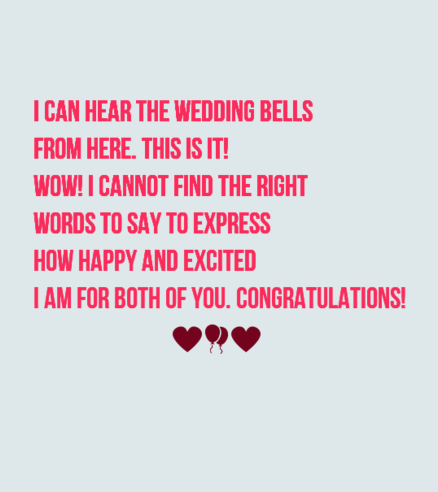 Congratulations on the wedding and may you feel the love of your friends and family members today and every day. I hope that your wedding day is everything that you want it to be – and I hope that married life is that, too. I want you to know that you mean the world to me and that your wedding is something that I am celebrating right along with you. 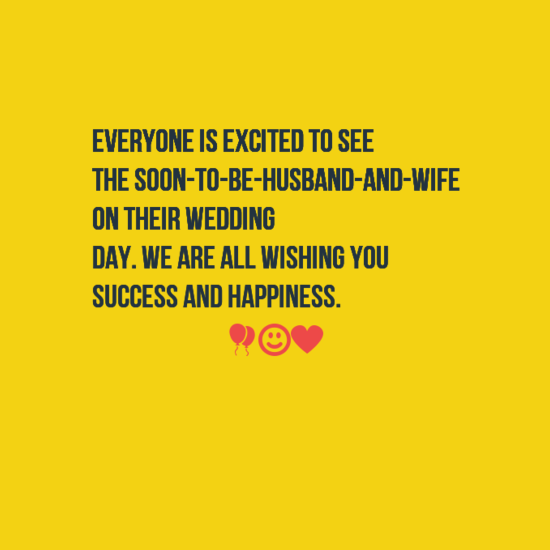 May your wedding go by smoothly, and may married life be all that you ever hoped it would be.